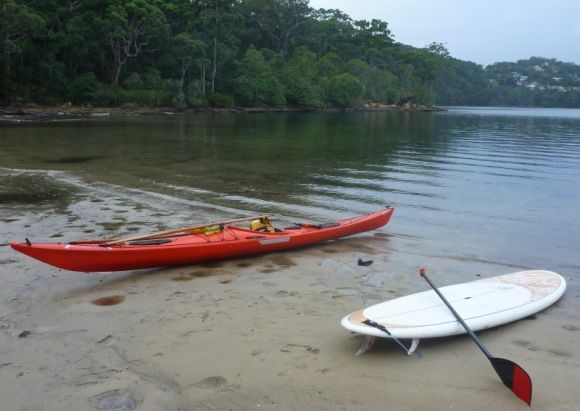 One of the great aspects of paddling is all the different flavours that are available. 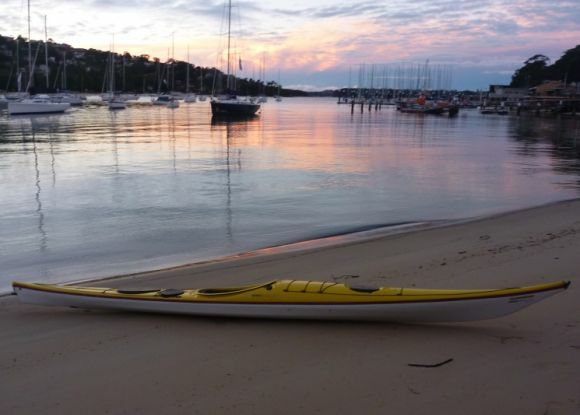 White water, flat water, ocean paddling, ski paddling, Greenland paddling, kayak polo, canoeing and of course the Stand Up Paddle (SUP) to name but a few. 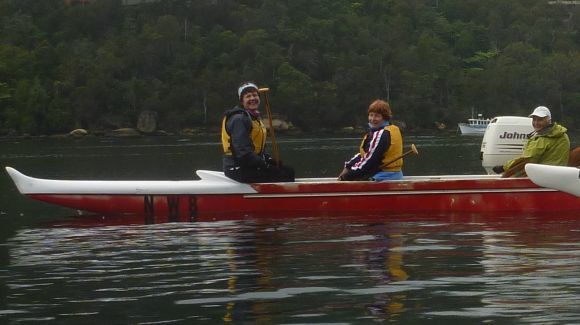 And there’s no reason why you can’t mix up the paddling types when you share the water, other than the obvious challenges of differential speed. 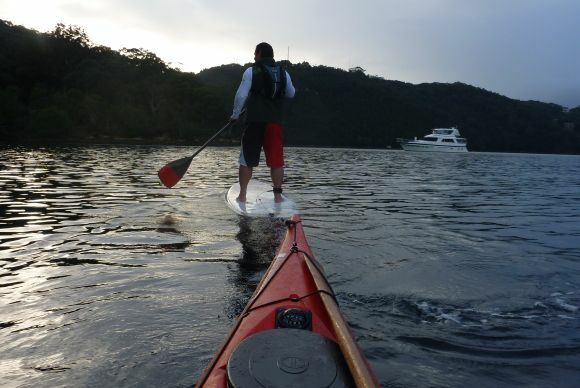 I was keen on an early paddle and invited SUP afficionado Rand to join me at the unreasonable put in time of 5.30am. 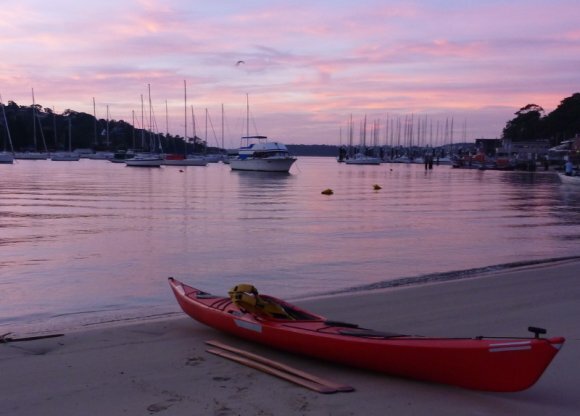 He’d mentioned that he was considering doing the Hawkesbury Canoe Classic 111km paddle marathon on his SUP and needed training, so what better than pushing off into the dark for a paddle up Middle Harbour? As I waited for him to get ready, I wandered around the shallows of The Spit with my torch looking for Ouchie. He was nowhere to be seen, but I did count several hand-sized baby stingrays in the area instead, sitting on the bottom like perfect miniatures of their bigger full-grown cousins. They were like little toys lined up in the water – my girls would have loved them! FP lazily slip-streaming Rand on his SUP - haha! Finally, and despite Rand’s nerves at pushing off into the dark, we set off north heading for the Roseville Bridge. He soon settled into the pace and enjoyed the lights on the water as very gradually the sky turned from black to a gentle grey glow. His fears now gone, we chatted away as the kilometres slipped behind us and we found ourselves at the Roseville boat-ramp. 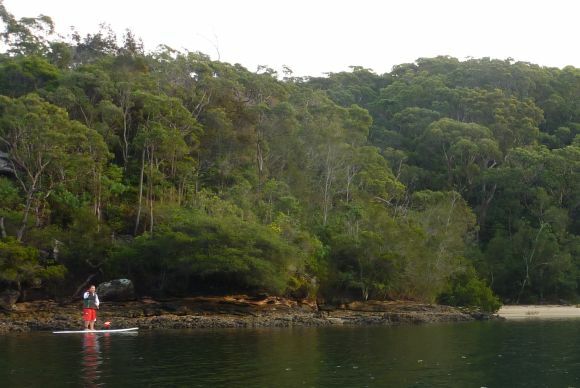 Turning around, we paddled back to Flat Rock Beach where we strategically placed ourselves ready to catch The Coffee Boat on it’s trip to Bantry Bay. With Rand unable to stop his SUP, he paddled in circles until eventually he decided to head into the beach to wait for his coffee. Within minutes Garry arrived in his little golden tug and brewed up a couple of fresh capuccinos for us, before chugging off into the distance. I paddled in and delivered the coffees to the beach where we enjoying the early morning light over our hot buckets of caffeine. Setting off again, we paddled barely a kilometre when we came across a funny sight. Up ahead an outrigger canoe had also flagged down the Coffee Boat, with Garry furiously making coffees for the whole crew. Hello, what have we got here then? 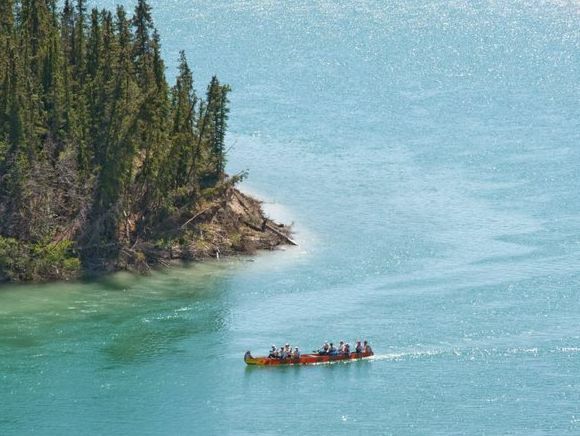 Rand and I pulled up for a chat and were amazed to hear that this crew of lady dragon-boat paddlers, know as the Yukon Buddies, were training to do the Yukon River Quest, a 746km paddle down the Yukon River in Canada that will take them around 65hours to complete! 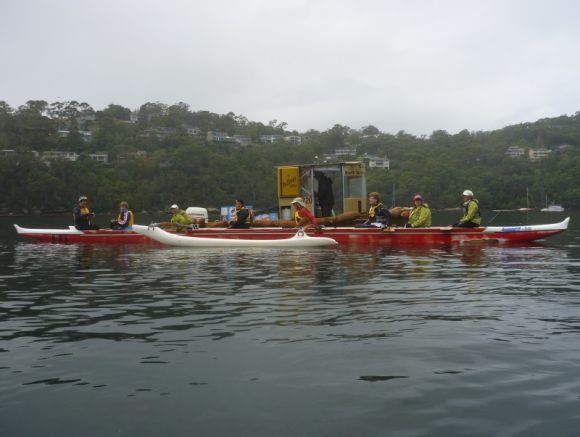 Just the week before they’d done the 111km Hawkesbury Classic course as training and were on track for their mammoth paddle task ahead. After saying goodbye and wishing the girls good luck, we paddled back to the The Spit just as the weather cracked open with a deluge of rain. We packed our gear into our respective cars and then went our separate ways, smiling after our fun morning’s paddle with our two radically different craft. THANKS, Sean!!! go bridge city!!! 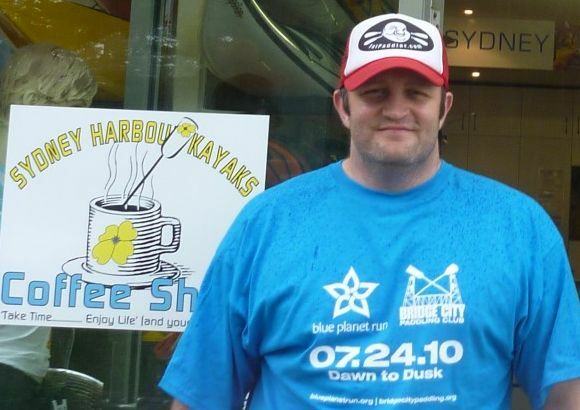 Thanks so much for your mention…it’s great to see the shirt going to good use in such a faraway land. Paddles Up! 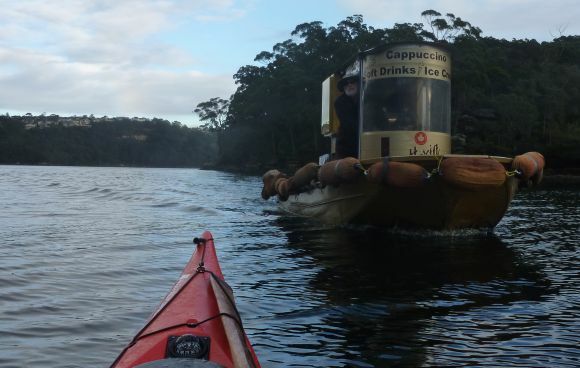 I cant believe you have a coffee boat!!!! I’ve made coffee on my boat, but thats just awesome!